We are continually trying to make sense of our world through the stories we tell and are told, but in our search for coherence, we often sacrifice our freedom and the rich randomness of life. In this passionate and lucid book, Michael André Bernstein challenges our practice of "foreshadowing," in which we see our lives as moving toward a predetermined goal or as controlled by fate. Foreshadowing, he argues, demeans the variety and openness that exist in even the most ordinary moments of life. And it is precisely ordinary life, with its random, haphazard, and contradictory choices, that Bernstein celebrates in his call for "sideshadowing"—an alternative practice that reminds us that every present is dense with possible futures. Bernstein sees the Holocaust as the prime example of how our tendency to "foreshadow" and "backshadow" misrepresents history. He argues eloquently against politicians and theologians who posit the Holocaust as foreordained and who depict its victims as somehow complicit with a fate that they should have been able to foresee. Instead, Bernstein proposes a radically new understanding of the relationship between the Holocaust and earlier Jewish experience, transforming how we read and write both individual and communal history. Foregone Conclusions is an extraordinarily wide-ranging book, both in its scope and in its broader intellectual and moral implications. From the latest biographies of Kafka to the peace accords between Israel and the PLO, from the role of cultural diversity in universities to the Crown Heights riots, Bernstein warns us against passively accepting our identities as being shaped primarily by historical or personal victimization. His book liberates us from stereotyped patterns of understanding the relationship between our lives as individuals and as members of racial, sexual, and historic/ethnic communities. Berstein ultimately opens a powerful new way to understand the principles governing how we read and write narratives--whether historical, personal, or literary. In striking original juxtapositions and critical evaluations of Marcel Proust, Robert Musil, and Aharon Appelfeld, Bernstein sugests the need for a new literary model based on the prosaics of daily life. 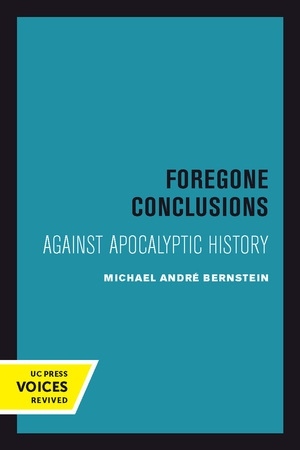 Bernstein speaks directly and persuasively to many of the most pressing issues in Jewish history, Holocaust studies, literary criticism, and cultural history. Foregone Conclusions is a provocative and poignant attempt to find coherence in our world without accepting either ineluctable destiny of pure coincidence. Michael André Bernstein was a Professor of English and Comparative Literature at the University of California, Berkeley. He is the author of TheTale of the Tribe: Ezra Pound and the Modern Verse Epic, Bitter Carnival: Ressentiment and the Abject Hero, and a volume of poetry, Prima della Rivoluzione.